Drawing: "A Tribute to Vinyl Siding. 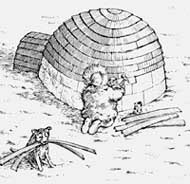 (Igloo)" reproduced from David Macaulay's Great Moments in Architecture. Copyright 1978 by David Macaulay and reprinted permission of Houghton Mifflin Company. A historic building is a product of the cultural heritage of its region, the technology of its period, the skill of its builders, and the materials used for its construction. To assist owners, developers and managers of historic property in planning and completing rehabilitation project work that will meet the Secretary's "Standards for Rehabilitation"(36 CFR 67), the following planning process has been developed by the National Park Service and is applicable to all historic buildings. This planning process is a sequential approach to the preservation of historic wood frame buildings. Historic wood siding exhibits rich and varied surface textures. They range from hand-split clapboards of short lengths with feather-edged ends (shown here), to pit or mill sawn boards which can be beveled, rabbeted, or beaded. Photo: NPS files. It begins with the premise that historic materials should be retained wherever possible. When retention, including retention with some repair, is not possible,then replacement of the irreparable historic material can be considered. The purpose of this approach is to determine the appropriate level of treatment for the preservation of historic wood frame buildings. Standard 6 of the Secretary of the Interior's Standards for Rehabilitation states that "deteriorated architectural features shall be repaired rather than replaced. Where the severity of deterioration requires replacement of a distinctive feature, the new feature shall match the old in design, color, texture, and other visual qualities and, where possible, materials..." The Guidelines further caution against "removing or radically changing wood features which are important in defining the overall historic character of the building so that, as a result, the character is diminished." Identify and preserve those materials and features that are important in defining the building's historic character. This may include features such as wood siding, brackets, cornices, window architraves, doorway pediments, and their finishes and colors. Undertake routine maintenance on historic materials and features. Routine maintenance generally involves the least amount of work needed to preserve the materials and features of the building. For example, maintenance of a frame building would include caulking and painting; or, where paint is extensively cracking and peeling, its removal and the re-application of a protective paint coating. Repair historic materials and features. For a historic material such as wood siding, repair would generally involve patching and piecing-in with new material according to recognized preservation methods. Replace severely damaged or deteriorated historic materials and features in kind. Replacing sound or repairable historic material is never recommended; however, if the historic material cannot be repaired because of the extent of deterioration or damage, then it will be necessary to replace an entire character-defining feature such as the building's siding. The preferred treatment is always replacement in kind, that is, with the same material. Because this approach is not always feasible, provision is made under the recommended treatment options in the Guidelines that accompany the Secretary of the Interior's Standards to consider the use of a compatible substitute material. A substitute material should only be considered, however, if the form, detailing, and overall appearance of the substitute material conveys the visual appearance of the historic material, and the application of the substitute material does not damage, destroy or obscure historic features. In many cases, the replacement of wood siding on a historic building is proposed because little attention has been given to the retention of historic materials. Instead, the decision to use a substitute material is made because: (1) it is assumed that aluminum or vinyl siding will be a maintenance-free material; and (2) there is the desire to give a building a "remodeled" or "renovated" appearance. A decision to replace historic material must, however, be carefully considered for its impact on the historic resource—even when the model planning process has been followed and the appropriate treatment is replacement. Therefore, this brief focuses on the visual and physical consequences of using a substitute material such as aluminum or vinyl siding for new siding installations on a wood frame historic building. These concerns include the potential of damaging or destroying historic material and features; the potential of obscuring historic material and features; and, most important, the potential of diminishing the historic character of the building. The character or "identity" of a historic building is established by its form, size, scale and decorative features. It is also influenced by the choice of materials for the walls—by the dimension, detailing, color, and other surface characteristics. This is particularly true for wood frame buildings which are the typical objects of aluminum or vinyl siding applications. Since wood has always been present in abundance in America, it has been a dominant building material in most parts of the country. Early craftsmen used wood for almost every aspect of building construction: for structural members such as posts, beams and rafters, and for cladding materials and decorative details, such as trim, shakes, and siding. Aluminum and vinyl siding are available in a variety of widths and colors, but the optional wood graining is not characteristic of real wood siding. Photo: NPS files. The variety of tools used, coupled with regional differences in design and craftsmanship, has resulted in a richness and diversity of wood sidings in America. For example, narrow boards with beveled, lapped joints called "clapboards" were used on New England frame dwellings. The size and shape of the "clapboards" were determined by the process of hand splitting or "riving" bolts of wood. The width, the short lengths, the beveled lapping, the "feathered" horizontal joints, and the surface nailing of the clapboards created a distinctive surface pattern that is recognizable as an important part of the historic character of these structures. The sawn and hand-planed clapboards used throughout the Mid-Atlantic and Southern states in the eighteenth and early nineteenth centuries, by contrast, have a wide exposure—generally between six and eight inches. The exposure of the siding, frequently coupled with a beaded edge, created a very different play of light and shadow on the wall surface, thus resulting in a different character. The "German" or "Novelty siding"—a milled siding that is thin above and thicker below with a concave bevel—was used throughout many parts of the United States in the late nineteenth and early twentieth century but with regional variations in material, profile, and dimensions. One variation of this type of milled siding was called "California siding" and was milled with a rabbetted or shiplap edge to insure a tight installation of the weather boards. Shingles were also commonly used as an exterior cladding material, and in buildings such as the Bungalow style houses, were often an important character-defining feature of the exterior. Shingles were often applied in decorative patterns by varying the lap, thus creating alternating rows of narrow exposures and wide exposures. Shingles were also cut in geometric patterns such as diamond shapes and applied in patterns. This treatment was commonly used in the gable end of shingled houses. Siding and wood shingles were often used in combination with materials such as cobblestone and brick in Bungalow style buildings to create a distinctive interplay of surfaces and materials. When aluminum was installed on the house on the right, the barge boards, scrollwork, columns, and railings were removed. The distinctive shingled gable and attic vent were covered, further compromising the building's architectural integrity. Photo: NPS files. The primary concern, therefore, in considering replacement siding on a historic building, is the potential loss of those features such as the beaded edge, "drop" profile, and the patterns of application. Replacing historic wood siding with new wood, or aluminum or vinyl siding could severely diminish the unique aspects of historic materials and craftsmanship. The inappropriate use of substitute siding is especially dramatic where sufficient care is not taken by the owner or applicator and the width of the clapboards is altered, shadow reveals are reduced, and molding or trim is changed or removed at the corners, at cornices or around windows and doors. Because substitute siding is usually added on top of existing siding, details around windows and doors may appear set back from the siding rather than slightly projecting; and if the relationship of molding or trim to the wall is changed, it can result in the covering or removal of these historic features. New substitute siding with embossed wood graining—intended to simulate the texture of wood—is also visually inappropriate. 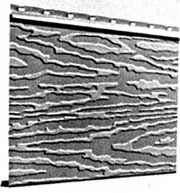 Exaggerated graining would have been undesirable on real wood siding and is generally found only after sandblasting, a destructive and totally unacceptable treatment for wood. While this discussion focuses primarily on the historic character of individual wood frame buildings, of equal importance is the context of buildings that comprise a historic district or neighborhood. Changes to the character-defining features of a building, such as distinctive clapboarding and other wall surfaces and decorative trim, always have an impact on more than just that building; they also alter the historic visual relationship between the buildings in the district. If character-defining weatherboards, clapboards or shingles are replaced on a number of buildings in a historic district, the historic character of the entire district may be seriously damaged. Because of the potential impact some substitute materials have on the character of a neighborhood or district, many communities regulate their use through zoning ordinances and design review boards. These ordinances and review boards usually require review and approval of proposed alterations to a historic building that could potentially impact the historic character of the building or the district, including the application of substitute materials, such as aluminum or vinyl siding. Preservation of a building or district and its historic character is based on the assumption that the retention of historic materials and features and their craftsmanship are of primary importance. Therefore, the underlying issue in any discussion of replacement materials is whether or not the integrity of historic materials and craftsmanship has been lost. Structures are historic because the materials and craftsmanship reflected in their construction are tangible and irreplaceable evidence of our cultural heritage. To the degree that substitute materials destroy and/or conceal the historic fabric, they will always subtract from the basic integrity of historically and architecturally significant buildings. The use of aluminum and vinyl siding really involves two separate industries. The siding materials themselves, including a variety of inside and outside corner pieces, trim and molding pieces and panning for window and door frames, are produced by a comparatively small number of manufacturers. The product information, advertising, and any manufacturer's warranties on the product itself are handled by this part of the industry. The installation of aluminum or vinyl siding is generally carried out by independent contractors or applicators, who are frequently called "home improvement" contractors, and they are not affiliated with the manufacturers. The manufacturer's warranties normally do not cover the installation, or any damage or defect resulting from the installation process. Since the manufacturer has little control over the quality of the installation, both the quality of the work and the sensitivity of the application are variable. This variation in quality has traditionally been a problem in the industry and one which the industry and its professional associations have attempted to correct through publishing and disseminating information on the proper application of vinyl and aluminum siding. When a building is in need of maintenance, such as the house on the right which needs painting, some owners consider installing aluminum or vinyl siding. The result (see left) can be a complete loss of architectural character due to the covering of details and change of scale due to inappropriate siding dimensions. Photo: NPS files. 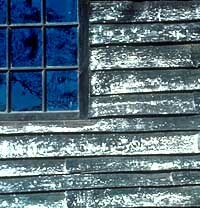 Although it is sometimes argued that an artificial siding application is reversible since it can be removed, there is frequently irreversible damage to historic building materials if decorative features or trim are permitted to be cut down or destroyed, or removed by applicators and discarded. The installation process requires that the existing surface be flat and free of "obstructions" so that the new siding will be smooth and even in appearance. To achieve the requisite flat surface, furring strips are usually placed over the wall surface (vertical furring strips for horizontal aluminum or vinyl siding and vice-versa for vertical siding). The potential danger in this type of surface preparation is that the furring strips may change the relationship between the plane of the wall and the projecting elements such as windows, door trim, the cornice, or any other projecting trim or molding. Projecting details may also cause a problem. To retain them, additional cutting and fitting will usually be required. Further, additional or special molding pieces, or "accessories" as they are called by the industry, such as channels, inserts and drip caps, will be needed to fit the siding around the architectural features. This custom fitting of the siding will be more labor-intensive, adding to the cost of the siding installation. The existing wall fabric is further damaged by the nailing necessary to apply siding. Either by nailing directly to the building fabric or by nailing the furring strips to the old siding, the installation of aluminum or vinyl siding will leave numerous holes in wood siding, molding, trim, window and door frames. When applied to brick or other masonry units, the nail penetrations attaching the furring strips and siding can cause irreversible cracking or spalling of the masonry. Although this reference to damaging masonry is included as a point of fact, the application of aluminum or vinyl siding is highly inappropriate to historic masonry buildings. The maintenance and periodic painting of wood frame structures is a time-consuming effort and often a substantial expense for the homeowner. It is therefore understandable that a product which promises relief from periodic painting and gives the building a new exterior cladding would have considerable appeal. For these reasons, aluminum and vinyl siding have been used extensively in upgrading and rehabilitating the nation's stock of wood frame residential buildings. For historic residential buildings, aluminum or vinyl siding may be an acceptable alternative only if (1) the existing siding is so deteriorated or damaged that it cannot be repaired; (2) the substitute material can be installed without irreversibly damaging or obscuring the architectural features and trim of the building; and (3) the substitute material can match the historic material in size, profile and finish so that there is no change in the character of the historic building. In cases where a non-historic artificial siding has been applied to a building, the removal of such a siding, and the application of aluminum or vinyl siding would, in most cases, be an acceptable alternative, as long as the abovementioned first two conditions are met. There are, however, also certain disadvantages in the use of a substitute material such as aluminum or vinyl siding, and these factors should be carefully considered before a decision is made to use such a material rather than the preferred replacement with new wood siding duplicating the old. Since aluminum and vinyl sidings are typically marketed as home improvement items, they are frequently applied to buildings in need of maintenance and repair. This can result in concealing problems which are the early warning signs of deterioration. Minor uncorrected problems can progress to the point where expensive, major repairs to the structure become necessary. If there is a hidden source of water entry within the wall or leakage from the roof, the installation of any new siding will not solve problems of deterioration and rotting that are occurring within the wall. If deferred maintenance has allowed water to enter the wall through deteriorated gutters and downspouts, for example, the cosmetic surface application of siding will not arrest these problems. In fact, if the gutters and downspouts are not repaired, such problems may become exaggerated because water may be channeled behind the siding. In addition to drastically reducing the efficiency of most types of wall insulation, such excessive moisture levels within the wall can contribute to problems with interior finishes such as paints or wallpaper, causing peeling, blistering or staining of the finishes. It cannot be overemphasized that a cosmetic treatment to hide difficulties such as peeling paint, stains or other indications of deterioration is not a sound preservation practice; it is no substitute for proper care and maintenance. Aluminum and vinyl siding are not directly at fault in these situations since property owners should determine the nature and source of their problems, then make appropriate repairs. The difficulty arises when owners perceive the siding as the total solution to their required maintenance and forgo other remedial action. The questions of durability and relative costs of aluminum or vinyl siding compared to the maintenance cost of historic materials are complex. It is important to consider these questions carefully because both types of siding are marketed as long lasting, low maintenance materials. Assuming that the substitute sidings are not damaged, and that they will weather and age normally, there will be inevitable changes in color and gloss as time passes. A normal application of aluminum or vinyl siding is likely to cost from two to three times as much as a good paint job on wood siding. A sensitive application, retaining existing trim, will cost more. Therefore, to break even on expense, the new siding should last as long as two or three paintings before requiring maintenance. On wood two coats of good quality paint on a properly prepared surface can last from 8 to 10 years, according to the U.S. Department of Agriculture. If a conservative life of seven years is assumed for paint on wood, then aluminum and vinyl siding should last 15 to 21 years before requiring additional maintenance, to break even with the maintenance cost for painting wood siding. Once painted, the aluminum and vinyl siding will require repainting with the same frequency as wood. While aluminum siding can dent upon impact and the impact resistance of vinyl siding decreases in low temperatures and, therefore, is susceptible to cracking from sharp impact, these materials are generally not more vulnerable than wood siding and shingles. All siding materials are subject to damage from storm, fire, and vandalism; however, there is a major difference in the repairability of wood siding versus substitute materials such as aluminum and vinyl. Although they can all be repaired, it is much easier to repair wood siding and the repair, after painting, is generally imperceptible. In addition, a major problem in the repairability of aluminum and vinyl siding, as mentioned above, is matching color since the factory finishes change with time. Matching the paint for wood siding has a greater likelihood of success. Because of high fuel costs, there is a concern for energy conservation in historic materials as well as in substitute materials. Because aluminum and vinyl siding can be produced with an insulating backing, these products are sometimes marketed as improving the thermal envelope of a historic building. The aluminum and vinyl material themselves are not good insulators, and the thickness of any insulating backing would, of necessity, be too small to add to the energy efficiency of a historic building. What energy savings did accrue as a result of a siding application would probably be as much the result of the creation of an air space between the old and new siding as the addition of insulating material. If the historic wood siding were removed in the course of installing the aluminum or vinyl siding (even with an insulating backing), the net result would likely be a loss in overall thermal efficiency for the exterior sheathing. Preservation Briefs Number 3, "Conserving Energy in Historic Buildings," notes that the primary sources of energy loss in small frame buildings are the doors, windows and roof. It is, therefore, more cost-effective to apply storm windows, weatherstripping and attic insulation than to treat the sidewalls of these structures. There are numerous publications on energy retrofitting which explain techniques of determining cost-effectiveness based on utility costs, R-factors or materials and initial cost of the treatment. Persons interested in this approach may wish to read "Retrofitting Existing Houses for Energy Conservation: An Economic Analysis" published by the National Bureau of Standards, or the U.S. Department of Housing and Urban Development booklet "In the Bank or Up the Chimney." 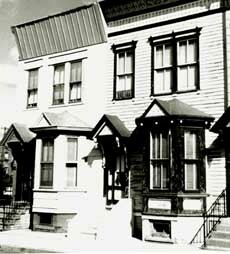 One such study in Providence, Rhode Island, determined that for a two-story house, twenty-five feet square, the payback period for twenty-three storm windows, two storm doors and six inches of attic insulation (R-20) was 4.4 years while the payback period of aluminum siding with an R-factor of 2.5 was 29.96 years. Most of the information which is available supports the position that aluminum or vinyl siding will not have a reasonable payback on an energy-saving basis alone. The intent of this brief has been to delineate issues that should be considered when contemplating the use of aluminum or vinyl sidings on historic buildings and assessing under what circumstances substitute materials such as artificial siding may be used without damaging the integrity of the historic building or adversely changing its historic character. Many property owners are faced with decisions weighing the historic value of their building and its maintenance cost against the possible benefit of aluminum and vinyl siding materials. To assist in making these decisions, "The Secretary of the Interior's Standards for Rehabilitation and Guidelines for Rehabilitating Historic Buildings" have been published and are available from National Park Service Regional Offices and State Historic Preservation Offices. Further, since rehabilitation projects for income-producing historic buildings often seek tax benefits under the 1981 Economic Recovery Tax Act, as amended, it is essential that all work, such as the replacement of exterior siding, be carried out in conformance with the Standards and be consistent with the building's historic character to insure that the tax benefits are not denied. The inappropriate siding applied to the house on the right has altered the character of the urban setting. Photo: NPS files. As stated earlier, the application of aluminum and vinyl siding is frequently considered as an alternative to the maintenance of the original historic material. The implication is that the new material is an economical and long-lasting alternative and therefore somehow superior to the historic material. In reality, historic building materials such as wood, brick and stone, when properly maintained, are generally durable and serviceable materials. Their widespread existence on tens of thousands of old buildings after many decades in serviceable condition is proof that they are the original economic and long-lasting alternatives. All materials, including aluminum and vinyl siding can fall into disrepair if abused or neglected; however, the maintenance, repair and retention of historic materials are always the most architecturally appropriate and usually the most economically sound measures when the objective is to preserve the unique qualities of historic buildings. The appropriate preservation decision on the use of a substitute material in the rehabilitation of a historic building must always center on two principal concerns: the possible damage or destruction of historic building materials; and, the possible negative impact on the historic character of the building and the historic district or setting in which the building is located. Because applications of substitute materials such as aluminum and vinyl siding can either destroy or conceal historic building material and features and, in consequence, result in the loss of a building's historic character, they are not recommended by the National Park Service. Such destruction or concealment of historic materials and features confuses the public perception of that which is truly historic and that which is imitative. This Preservation Brief was written by John H. Myers, Historical Architect, formerly with Technical Preservation Services, and was published first in 1979. The Brief was substantially revised in 1984 by Gary L. Hume, Deputy Division Chief, Preservation Assistance Division. H. Ward Jandl, Chief, Technical Preservation Services Branch, and the following Branch staff members are to be thanked for reviewing the manuscript and making suggestions that were incorporated into the final text: Emogene A. Bevitt, Kay Davidson Weeks, and Susan Dynes. "Condensation Problems in Your House: Prevention and Solution." Information Bulletin No. 373. Washington, D.C.: U.S. Department of Agriculture, 1974. Kiefer, Matthew J. "Vinyl and Aluminum Siding: Pro and Con." Report to the Ashmont Hill Study Committee. Boston, Massachusetts: The Boston Landmarks Commission, 1977. Landmark and Historic District Commission. Vol. 4. No. 5. 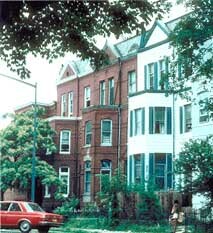 Washington, D.C.: National Trust for Historic Preservation. October 1978. Moisture Conditions in Walls and Ceilings of a Simulated Older Home in Winter. Madison, Wisconsin: Forest Products Laboratory USDA, 1977. Performance Criteria for Exterior Wall Systems. Washington, D.C.: National Bureau of Standards, 1974. Rehab Right. Oakland, California: City of Oakland Planning Department, 1978. Skoda, Leopold F. Performance of Residential Siding Materials. Washington, D.C.: National Bureau of Standards, 1972. Wood Handbook: Wood as an Engineering Material. Washington, D.C.: Forest Products Laboratory. U.S. Department of Agriculture, 1974.